This is our best quality pad. It has a heavy duty covering fabric and the best quality foam filling. Guaranteed for 5 years. These deluxe pads should last well over 10- 15years. Which pads would be best for me? How long you want the pads to last will help you determine which set will best suit your needs. How long do the pads last? 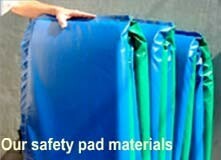 Our deluxe pads generally last 10-15 years or more. Most customers will replace economy pads every 1 to 3 years. What size trampoline pad do you need? Most round trampolines have either a 13' or 14' diameter frame. The diameter is determined by taking measurements from the outside edge of the steel frame. The 16' frame pads are $ 595.00.